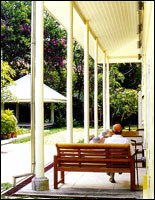 The Baan Bayan (or Bayan House in English) was originally built in the early 1900’s. It has the undeniably superb location in one of the most sought after areas in Hua Hin. Blessed with its own generous unblemished beach front and a breathtaking panoramic view of the Gulf of Siam, the resort is advantageously, only a few minutes away from Hua Hin town center, market and airport. - Check-out time is 12:00 noon. Requests for early check-in or late check-out will be considered subject to availability. - Written cancellation by email or fax is required to E-Biz Travel at least 7 working days prior to arrival date (not including Sat, Sun & Public Holidays), otherwise, one night room rate (per each room reserved) as penalty will be charged. - Full payment of penalty charge will be applied in case of guest No Show. 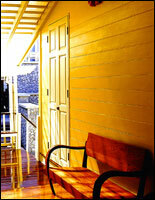 Baan Bayan links a glorious past of Hua Hin to an exciting present. Offering a mere 21 rooms comprising of 3 suites, 10 sensational seaview rooms and 16 rooms with unparalleled prospect of our courtyard or tropical garden, Baan Bayan will allow guests to sink back into a history rich with associations of the swinging, glorious 1920/30’s. 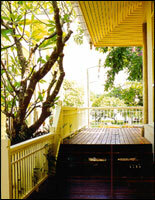 The property reflects a period when beauty and outward appearances were of paramount importance in Thai society. It is positioned as a small exclusive luxury beach hotel offering the charm of a traditional Thai aristocratic beach house. Guests who have a desire to experience rich history and culture or seek a different and uniquely quaint vacation venue will undoubtedly appreciate the serene atmosphere and ambience at The Baan Bayan. The Garden Room (5 Rooms, 48 sq.m.) 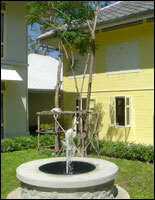 is strategically located to offer a view of our tropical garden. 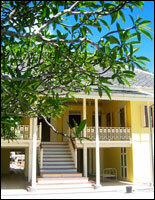 It is ideal for a single holiday maker or couple who seeks serenity and privacy amidst peaceful, natural surroundings. The Courtyard Room (6 rooms, 55 sq.m.) 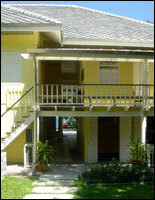 - offers a view of our courtyard and surrounding compound. The rooms provide areas for basking in the sun or just lounging during the late afternoons as well. The Sea View Room (3 rooms, 55 sq.m.) - offers an utterly breathtaking view of the ocean. Imagine waking up to the picturesque image of the sea at sunrise or simply taking in the quiescent beauty as dusk approaches. The Irada Suite (courtyard view : 1 room, 55 sq.m.) - great for a small family of 3 seeking refuge from the hustle and bustle of city life. The Bannika Suite (sea view : 1 room, 53 sq.m.) 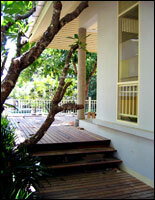 - is also located on the original Baan Bayan with a spectacular sight of the compound and beach. 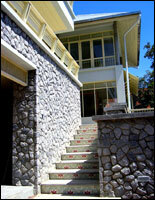 The Sea View Villa (3 villas, 55 sq.m.) - a rare find for honeymooners or newly weds who yearn for privacy or exclusivity. Unsurpassed visual treat of the sea. The Taraban Suite (sea view : 1 room, 63 sq.m.) 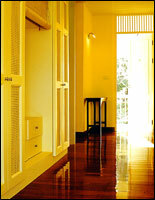 - is located on the top level of the original Baan Bayan facing the outdoor pool and beach front. This is perhaps our biggest room covering over 110 square meters. 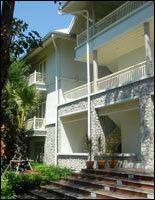 Located on the ground level of the original Baan Bayan with a fantastic view of the swimming pool and the sea. This is a perfect place for an afternoon gathering with friends and family members as the ocean breeze is simply amazing here. Dinner : 18:00 - 22.00 hrs. serving both Thai and international/fresh seafood dinner by the beach front. If you prefer to dine in the privacy and comfort of your own room or deck, our room service is available serving both Thai and International cuisines. An open-air bar where you can enjoy our list of beverages. Cocktails, and snacks by or in the pool area whilst you relax and lounge on a lazy afternoon. Aromatic and traditional Thai Massages are available upon request. Immerse yourself in the therapeutic touch of our experienced masseurs by the poolside verandah with a fantastic view of the sea.